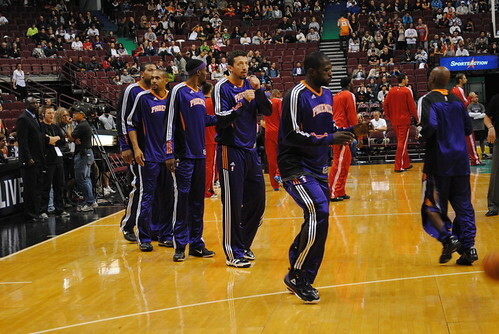 Last week the Phoenix Suns brought a slice of the NBA to Rogers Arena in Vancouver for some pre-season action versus Canada’s only basketball team, the Toronto Raptors. 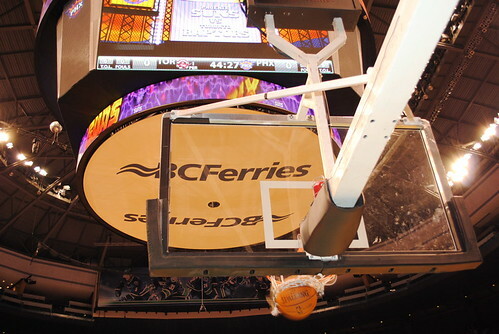 It’s been nearly a decade since basketball had a home in BC, so for hoop fans in this city, live pre-season action is a huge deal. Suffice it to say, a large component of the sold out crowd was fans of Victoria-raised Steve Nash, excited to see BC’s “Golden Boy” displaying his skills on home turf. 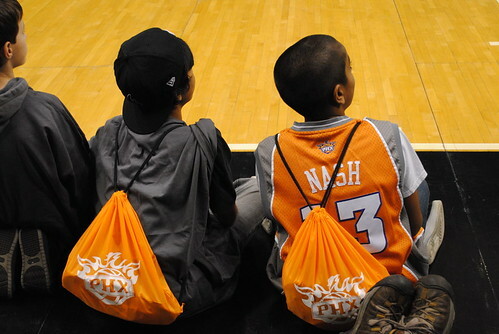 Not long after the exhibition game was announced, I was invited by the Suns’ digital media team to assist on reporting the event for Suns.com. The invitation was a true honour and it was incredibly exciting to be a part of such an event in my hometown. In celebration of the evening that was, I wanted to take the opportunity to share a number of the photographs I snapped. 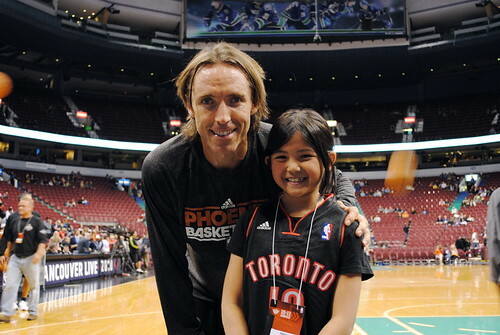 Steve Nash was intense about warming up during the pre-game shoot around. 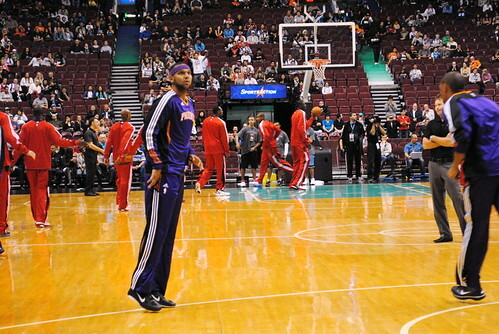 Jared Dudley hit nothing but net during the warm up. 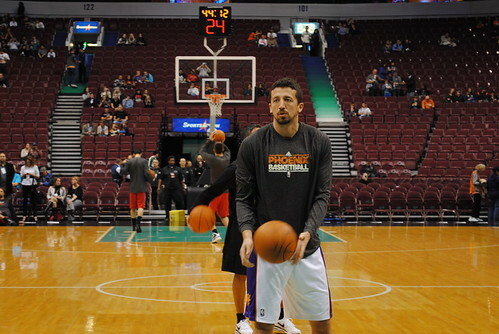 All eyes were on Phoenix’s biggest off-season acquisition, Hedo Turkoglu. Robin Lopez, the legendary Grant Hill and Garret Siler during the warm-up. 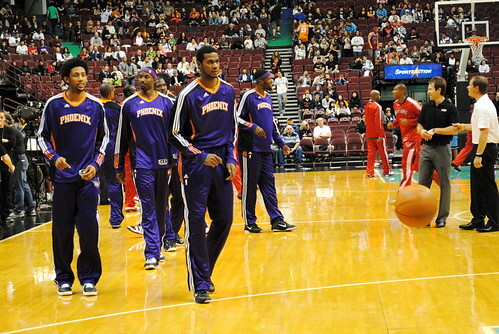 Josh Childress, Zabian Dowdell and Earl Clark weren’t sweatin’ the pending match-up. Grant Hill, Hakim Warrick, Hedo Turkoglu and Jason Richardson are the epitome of skill and style as they rock the official colour of the Purple Palace. 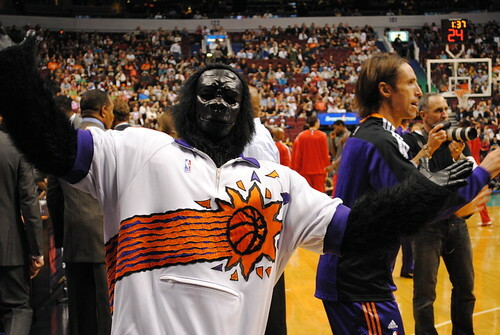 Even the Suns’ official mascot, the Gorilla, was on hand to amp up the crowd. 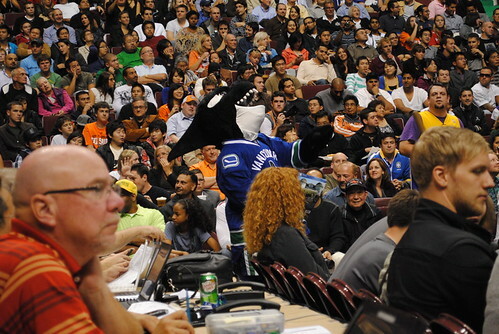 However, sometimes mascots get star-struck too. 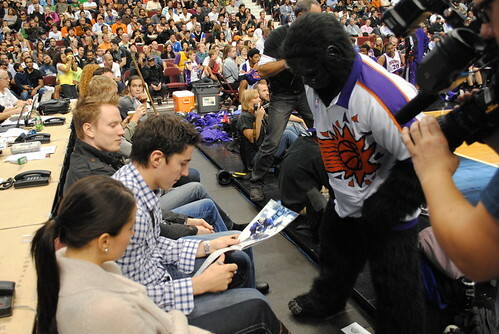 Alex Burrows of the Vancouver Canucks was happy to oblige the Gorilla with an autograph. 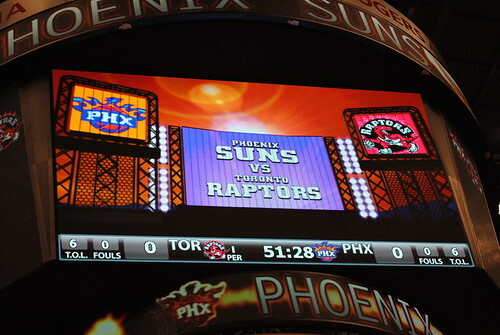 Despite all the hyped anticipation, the Suns ultimately fell to the Raptors in a crushing defeat with a final score of 78-129. 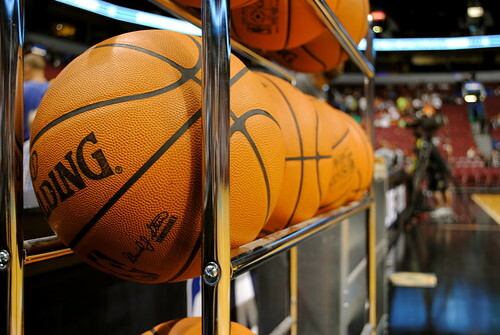 Luckily winning isn’t everything and the game still provided high energy entertainment and lasting memories for all of us – myself certainly included. 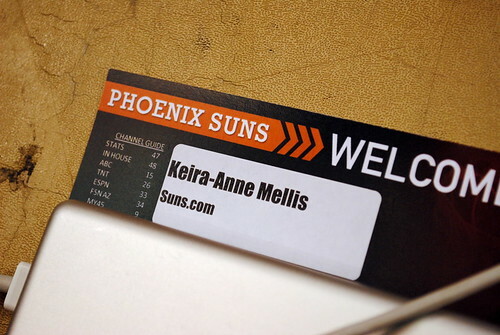 I’d like to especially thank Jeramie, Stefan and the rest of the Suns’ crew for providing the opportunity. 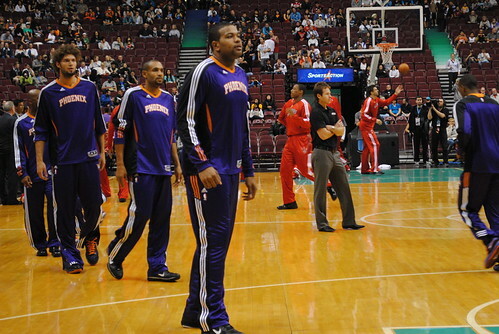 If you’d like to read my summary of the evening on the Suns’ blog, you can do so here. I had a friend on hand to assist in photography; his phenomenal photo set can be viewed here on Flickr. Great photos!! 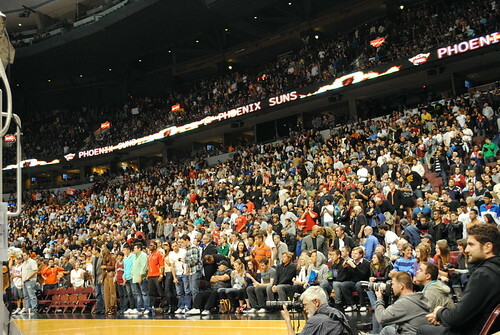 Shawn was just saying how he’s really going to miss Blazer-mania this year. We feel like such losers being the only non-hockey sports fans in town! Amazing photos and recap! You did such a nice job. What a fantastic opportunity… you deserve it! Great photos Keira. 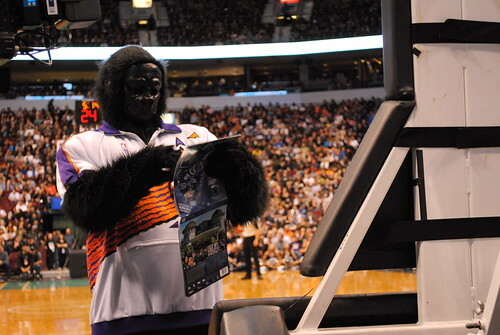 But the clincher has got to be the mascot getting Alex’s autograph. I bet even Burrows got a kick outta that.